In May Sat - Sun 12 - 16:00. Trails close 17:00. In June - July Tue - Sun 12 - 19.00. Trails close 21:00. In August Tue - Sun 12 - 18.00. Trails close 20:00. In September Sat 12 – 16.00. Trails close 17:00. 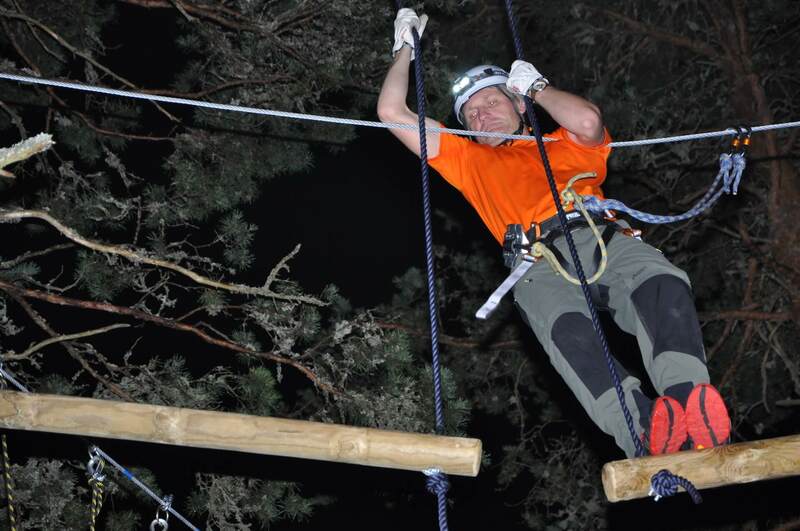 Muhu Adventure Park has eight rope courses of different complexity with a total length of 1,200 metres. All climbers are equipped with individual safety gear and will undergo safety instruction after which each climber will take a training course monitored by our instructor who will thus be able to see if the climber is able to use the safety gear properly, or needs further safety training. 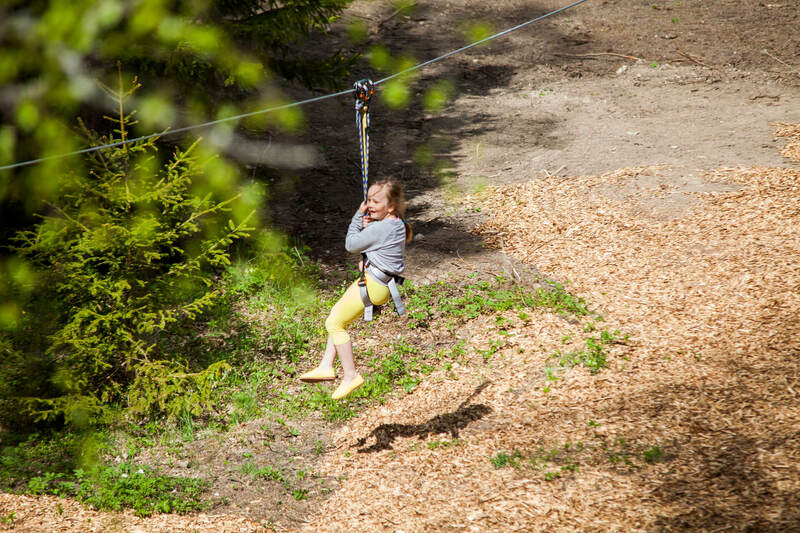 The trail contains three elements and a small zip line that gives one the thrill of flying through the air. This is the course used for training and instructing all our visitors so that the instructors can be sure that every climber is able to use safety gear. Taking the training trail is mandatory for all climbers despite their previous experience. The trail consists of 9 elements and it is about 50 cm from the ground, so that a parent or a carer is able to easily assist their child. Children can also try a barrel ride. The course is suitable for children at least 110 cm tall. Young children shorter than 110 cm are allowed to the trail only under supervision of a parent who has passed special safety instruction. For safety reasons, the trail is available for children who are not taller than 140 cm. 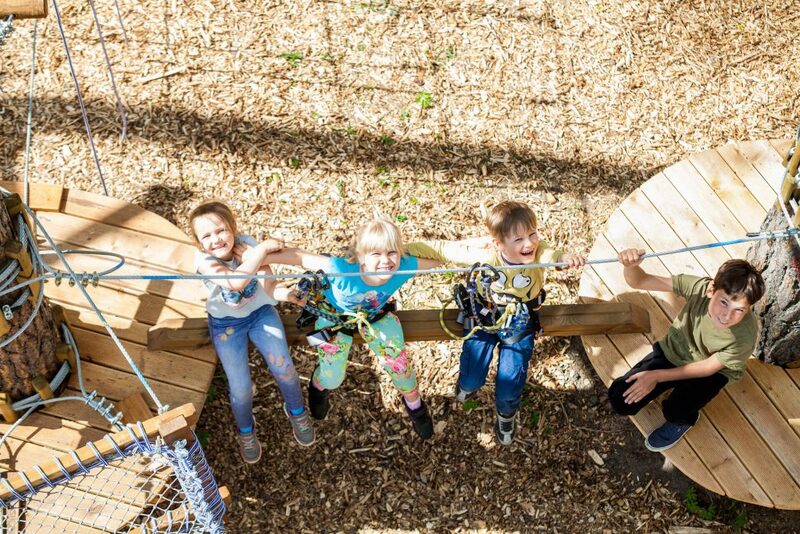 This trail has 7 elements and a zip wire at a height of one metre from the ground. It is meant for children 120 cm or over, but it is also available for adults needing to get used to climbing before they partake the higher and more challenging courses. These are two separate trails that can be passed either separately or moving between them/from one trail to the other. 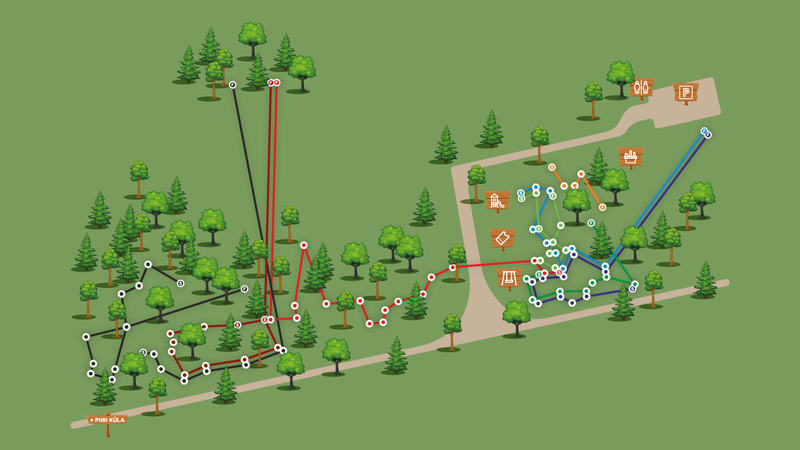 The blue trails contain a total of 18 elements with one long zip wire. 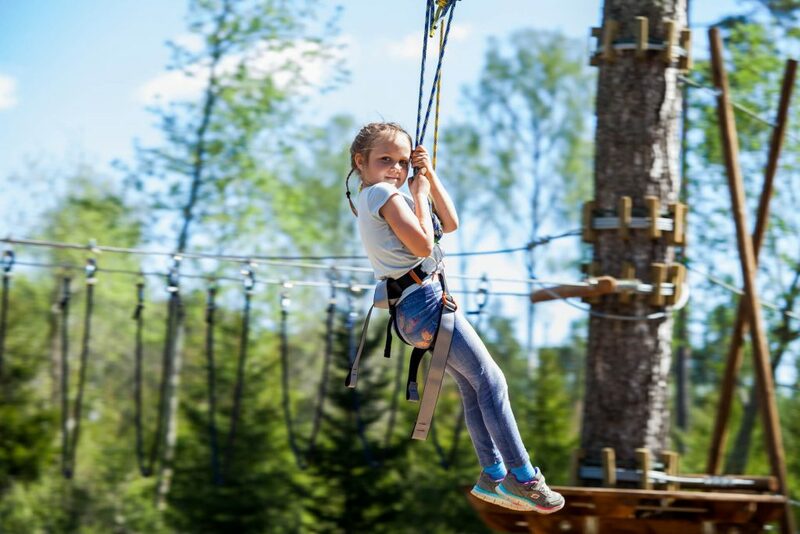 In case of blue trails, there is an option to go to the trail in the middle of the course, and after taking a couple of elements, to enjoy a long flight through the air on the zip line. From the Blue trail, one can also access the Red and Black trails. Trails are meant for visitors who are at least120 cm tall. Children under the age of 7 are allowed to the trail under supervision of a responsible adult or instructor only. Red trails with their rather complex elements are meant for experienced climbers having successfully taken the Blue trails and ready to proceed to the next level. 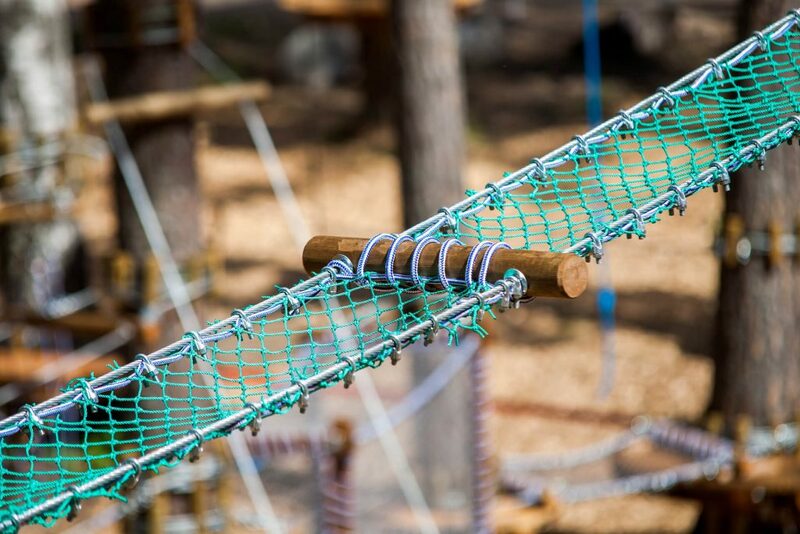 The Red trails contain a total of 27 elements (including the ladder for mounting and the zip line for dismounting). Red trails are for visitors who are at least 140 cm tall. 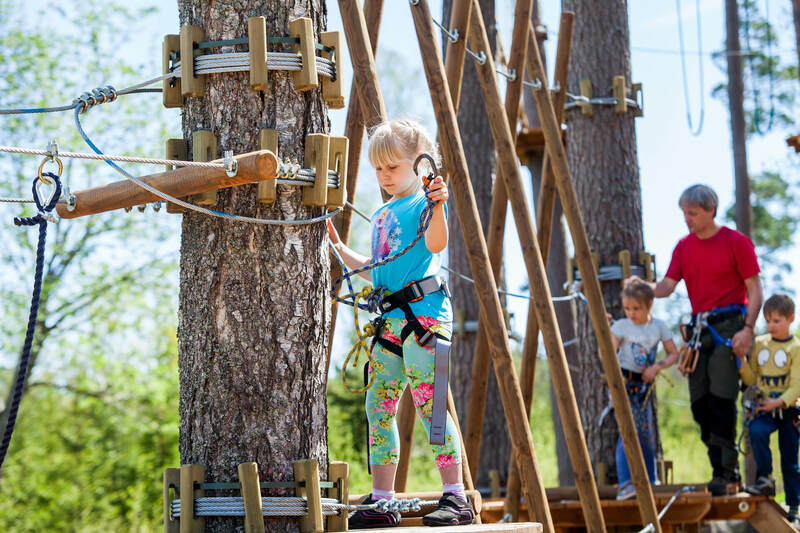 Welcome to Muhu Adventure Park – a perfect outdoor hub of challenging activities for seasoned adventurers as well as for total beginners, from young children to adults. Even though all our trails are suitable for taking without assistance, visitors can have an instructor to supervise and assist them in taking the trail. We will find a way to encourage also people with a fear of heights to try out our activities. Come and enjoy the beautiful forest and sensational climbing adventure either on your own, with your friends or family! MUHU ADVENTURE PARK is a new adventure centre located on the Island of Muhu, in the territory of a former Soviet military base, and those visitors who do not care much about climbing have the opportunity to look at the remains of the military facility. (Consists of two green trails) The Light green trail (trail 1) is recommended for children up to 140 cm tall. The Dark green trail (trail 2) is suitable for unaided climbing of children who are at least 120cm; smaller children need adult assistance. (contains Green and Blue trails) Maximum 17 years old, minimum 120 cm tall. Children under 7 years are given access to Blue trails (2 and 3) under adult assistance only. (Contains Green and Blue trails) Minimum 18 years old, minimum 120 cm tall. (All trails are included) Maximum 17 years old, minimum 140 cm tall. (All trails are included) Minimum 18 years old, minimum 140 cm tall. (contains Blue and Red trails) Maximum 17 years old, minimum 140 cm tall. (contains Blue and Red trails) Minimum 18 years old, minimum 140 cm tall. (contains Red and Black trails) Maximum 17 years old, minimum 140 cm tall. (contains Red and Blac trails) Minimum 18 years old, minimum 140 cm tall. (Contains trail nr 8. ) Maximum 17 years old, minimum 140 cm tall. (Contains trail nr 8. ) Minimum 18 years old, minimum 140 cm tall. – for groups of 6-10 people. Prebooking required. Minimum 140 cm tall. Muhu Adventure Park reserves the right to make changes in its price list without previous notification. Whether it's a campaign, or a special offer price, or one discount at a time! Instructor-accompanied activities (one hour, one instructor) 15 €. School groups and children groups – price to be negotiated. Teacher – free. The use of playgrounds is under the responsibility of the adult attendant. 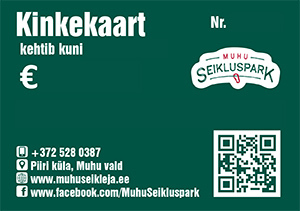 Gift vouchers can be obtained in the park, requested by sending an email to: info@muhuseikleja.ee or calling +372 5342 1974. 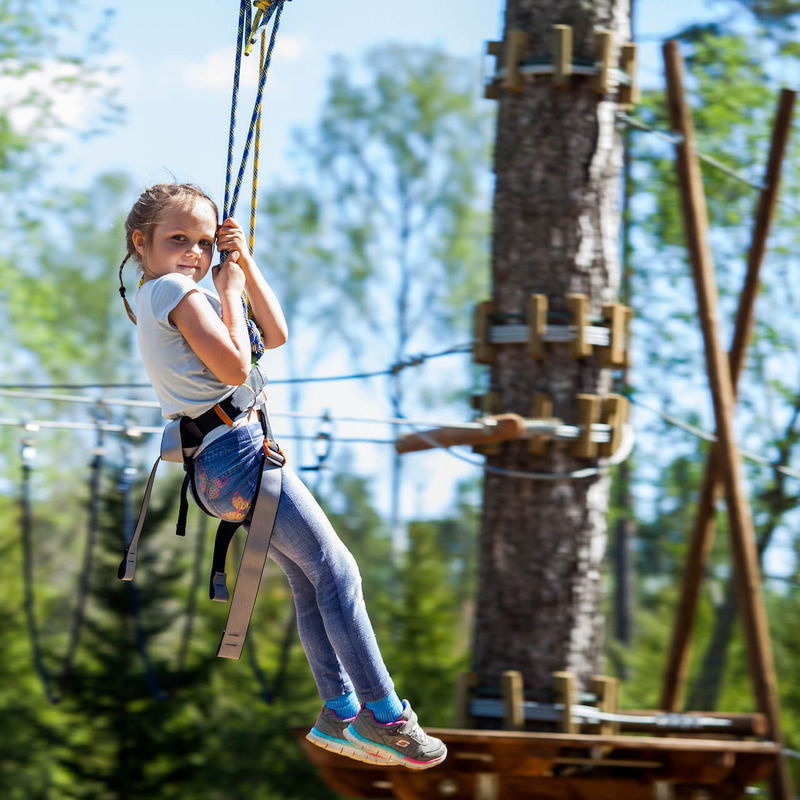 Muhu Adventure Park Terms & Conditions. Please read here. •	Children under 15 years of age are allowed to the trail with a written permit of an adult who takes responsibility for the child. •	Visitors who are over 190 cm tall and weigh more than 110 kg need to follow carefully special instructions given to them. Please remember that our Blue trails are meant also for 120-cm children. 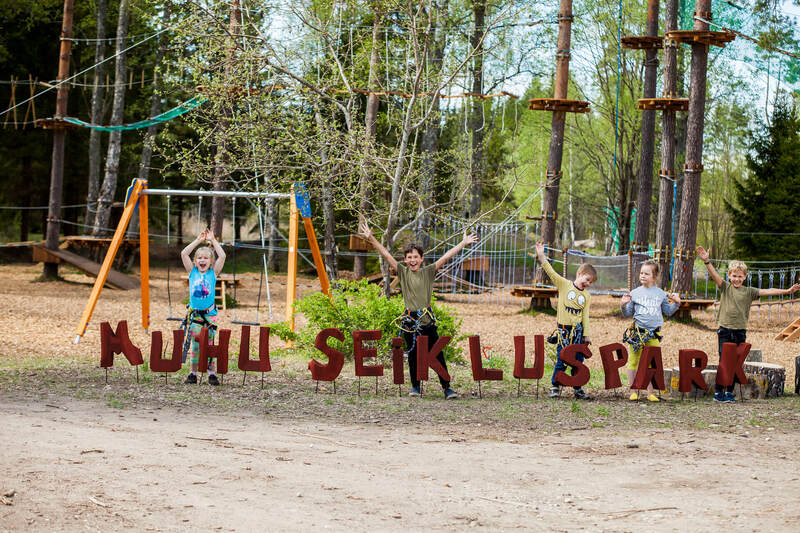 •	Muhu Adventure Park reserves the right to make changes in its price list without previous notification. •	The park instructor has the right to decide on closing/opening the park facilities, depending on safety conditions. •	Children use the playgrounds under supervision and responsibility of their adult carers. For reservation and additional information, please send e-mail to info@muhuseikleja.ee. The booking will be charged as a prepayment of 50% of the booking fee for the estimated price of the service. The booking fee must be received at least 3 days before the event, and the receipt of payment will confirm the reservation. The remaining amount will be paid in accordance with the used service in an adventure park on the spot in cash or as a card payment. If your plans change, you can reset or cancel the booking at least 48 hours before the scheduled visit. In this case, 100% of your prepaid amount will be refunded. In case of changes, please inform us by email info@muhuseikleja.ee or by phone 52 80 387.